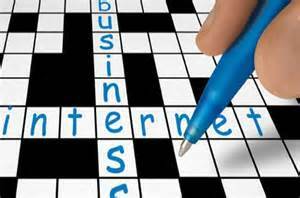 After heeding the first rule of business, “Find a need and fill it,” you want to explore where your business can go by using the internet. The internet reaches customers that a print campaign can only dream of, and if you learn the basics, your business will thrive. Let’s begin with a quality website. First of all, you need to secure a domain name from a domain name register, such as godaddy.com . Choose a name that is pertinent to your business and is memorable. You may have fun selecting the name, but the end result is that you want your customers to think of you first when they need your product or service. If you write down several names and then pick the best one, then you will have practiced your copywriting skills that will be sure to come in handy later! Pay the registration fee and you are ready to begin building your first website. It’s best to have professional techs help you out this first time. The next step is finding a web host for your domain name, such as 1and1.com . Their techs provide expert service and consult with you in the exciting process of choosing font, layout, and checkout services. Remember, you have only about five seconds to grab your customer’s interest, and a professional website designer realizes that a basic rule is to help a customer make a purchase by clicking no more than three times. Let’s return to the window blinds example. Your potential customer searches online for window blinds, sees your catchy business name, and clicks on it. That’s click one. Next, the customer selects the sort of window blinds desired, such as Venetian blinds, from a dropdown menu. That’s click two. Finally, the customer chooses the style, color, and price of Venetian blinds from your inventory, and heads for checkout. That’s click three. With an eye to future business, consider having an opt-in offer on your site so that customers may give their e-mail addresses for special sales or promotions that you may offer in future. It may be tempting to design your site with fancy graphics or audio/visual spots, but use them only if they enhance your message. Remember, your site is your online store, and you want your store to be as friendly as you would be in person.